With the Nintendo Switch out there in good supply, accessories are coming thick and fast, Venom have released a starter kit, if you’re in the market for one. The main part of the kit consists of the clamshell hard case, finished in matt black the Venom logo is restricted to the zipper pull, which makes it feel a little less like a walking advert for the maker. Internally the bottom half of the shell consists of an area large enough to hold the Switch with the joy pads attached. The console is held in place with a couple of elasticated bands which have enough play in them to be able to insert the Switch without fear of catching on the joysticks, but strong enough to keep the switch in place. The upper part has an internal mesh pocket. I’m not usually a huge fan of these as there is the chance that stored items may scratch the screen. However, in this case you also get a glass screen protector, which is preferable to the usual plastic ones and should led an elevated level of protection. 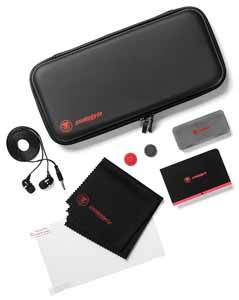 The set contains a set of earbud speakers which give decent enough sound for game playing. Also included is a cleaning cloth, even if it a little on the small side. For the most part the kit is pretty standard fare, but what makes it stand out is the superior glass screen protector. Probably worth picking up for that alone.